Badminton Airfield is an unlicensed privately owned airstrip that is utilised by aviators entirely at their own risk. It is located 5 miles EAST of CHIPPING SODBURY; 3 miles north east of Junction 18 VRP on the M4. The grass runway is half a mile WEST of the Lake in front of Badminton House. Warning – Unmarked Temporary Transmission Masts in the vicinity of the airfield during the Horse Trials. Warning – Public footpath crosses the runway at mid-point near hangar. The use of Drones anywhere on the Horse Trials site is strictly forbidden throughout the week of the Event. The Airfield is strictly PPR. Airfield is not open on Wednesday 1st May. For arrivals on the morning of the Horse Trials Cross Country day (Saturday 4th May), a pre-booked arrival time (slot) allocation system may be used to manage the flow of air traffic during busy periods. Aircraft must not fly over the Main Arena (approx. 400 metres east of the runway) while the Dressage (Thursday 2nd & Friday 3rd May) or Show-jumping (Sunday 5th May) are in progress. Contact should be made with Badminton Radio on 123.180 prior to arrival overhead. Aircraft should join overhead at 2500alt on the Cotswold QNH available from Brize Radar 124.275 or Bristol Radar 125.650. Aircraft should then join the circuit at 1500alt (Approx’ 1000agl) for a right-hand circuit for RW25 or a left-hand circuit for RW07. If the circuit is reported clear, aircraft may elect to join direct to a downwind or to a final position. Helicopters may elect to route below circuit height to the Helicopter aiming points north and south of the Hangar. Pilots shall keep a good lookout for other aircraft, particularly non-radio aircraft and transit traffic. Aircraft should be operated in a safe and predictable manner and should not manoeuvre in a way that could attract adverse attention. Pilots should be mindful of legislation concerning the overflying of large crowds. Aircraft manoeuvring on the ground should keep a good lookout for pedestrians and uncontrolled vehicles. Aircraft commanders are responsible for the safety of their passengers walking to and from their aircraft. When available ground staff may assist with this. DEPARTURE – Aircraft must not fly over the Main Arena (approx. 400 metres east of the runway) while the Dressage or Show-jumping are in progress. Departures from RW07 should be mindful of overflying the crowd area. A left turn of 30deg’ is recommended as soon as practical after departure. TIME OF DRESSAGE: Thursday 2nd & Friday 3rd May 0900 – 1300, 1400 – 1700. SHOWJUMPING: Sunday 5th May 1030 – 1230, 1400 – 1600. 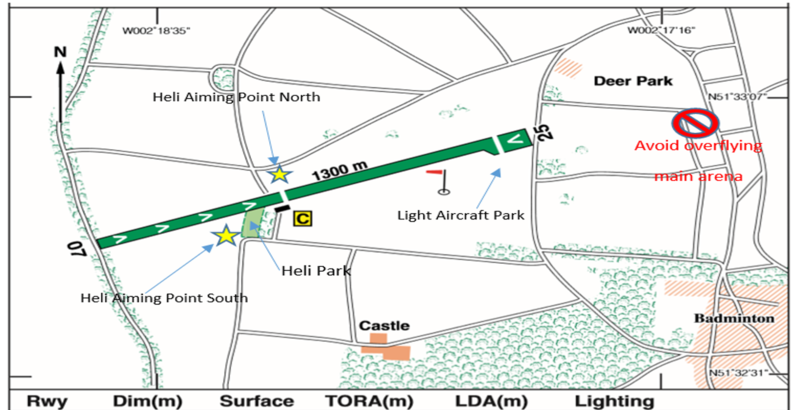 CROSS-COUNTRY Saturday 4th May – aircraft must land AT THE LATEST BY 11:00. AIRCRAFT MAY NOT TAKE OFF BEFORE THE LAST HORSE HAS PASSED THE QUARRY JUMP (usually about 1700 hours). However, it may be possible that earlier departures to the west may be allowed, depending on the prevailing wind and take-off run required. Helicopters that are parked adjacent to the Hangar may arrive or depart at any time of day. Note: Badminton Airfield is not open and Aircraft are not permitted to land on WEDNESDAY 1st MAY. LANDING FEES: Per Landing – £40.00 (payable on landing only). (CASH ONLY). If you wish to pay in advance for personal admission tickets book on line – see tickets – or contact the Box Office: Tel: + 44 (0) 1454 218375. If paying on arrival (cash only). PLEASE DOWNLOAD DETAILS AND COMPLETE AND RETURN FORM AS DIRECTED. A prior telephone call from all visiting aircraft is mandatory: Tel: Airfield Office: 01454 218333 or During Event – Tel: 01454 218888.